I think many of us must feel like this football team felt on the last play of this game. I've never seen anything like this. See all those laterals? That's you, submitting and submitting and then submitting again, until you get that phone call one day: "Hey, you, we'd like to publish your book!" Wow, you can actually pre-order my book now. It will probably show up on Amazon and all that kind of stuff soon, but this is the first time I've seen it anywhere. Now it really feels official. I'm such a disturbed person that I will probably order one just for kicks. In case, er, you, er, suddenly have a desire to, er, pre-order it, go to this site: CLICK HERE. My next question in the queue is from none other than Sarah Kiesche, my very own little sister. Proof of her relation to me is evident in the fact that she now has the writing bug, which makes me proud. 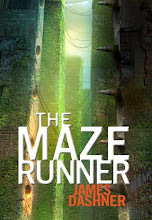 Her question: Do you (meaning me, James Dashner) have any advice for beginning writers? This is a good one since I get it without fail no matter where I go. When all else fails, people either ask, 1) Where do you get your ideas? or 2) Do you have any advice for aspiring writers? Although a good question, it's also very difficult to answer. It'd be like me going up to an artist and asking him or her if they have any advice on how to paint portraits. I'll start by sharing something I learned from Stephen King that is very wise: you can either write, or you cannot. You either have the talent or you do not. While you can become a BETTER writer, you cannot BECOME a writer. So, first, ask yourself honestly if you think you might have a knack for it. (And no, Sarah, I'm not trying to give you a hint. I've seen your writing, and you have talent.) There's no magical formula. There's no checklist. Pick up something you've written and read it again. Is it okay? Passable? Not THAT bad? If so, then you're on the right path. Next, you need to work your bootie off. I'm not sure why, but many people seem to think writing is different from any other talent. They think you just do it, and your skill level never changes. Nothing could be further from the truth. Writing is like basketball. Writing is like dancing. Writing is like playing the piano. You must practice, practice, practice. Write, write, write. Everytime you do, you will improve. Don't worry about how good it is yet. Just write. Then write some more. By doing this alone, you will improve drastically. That is, if, like I said earlier, you have the raw talent. In the midst of all these obsessive compulsive writing fits, read a few books on writing. Go to the Reference section of a bookstore and you'll see a ton of them. If anyone reading this blog has suggestions on good ones, please leave a comment. Read some books and make sure you're sound on the technical aspects of our craft. Write a novel from beginning to end. I mean it. I don't care if it's the worst book in history, write a beginning, a middle, and an ending, and everything in between. You won't believe the magical power that will come over you once you've accomplished this task. Is it easy? No. Will it win the National Book Award? Probably not. Do I hate when people ask rhetorical questions over and over? Yes. If you write and finish a complete book, you will suddenly find it much easier to do the next one. It's like a marathon, I suppose, though I've never done it. (Though I did come in 12th place in my neighborhood 5k. Yah, that's right.) I imagine the first marathon is brutal and full of wanna-give-ups. But once you KNOW you can do it, the 2nd time around becomes much easier. I'm guessing. It took me 3 years to write my first book. The second one, 9 months. My last one, 7 weeks. I'm talking first drafts, here. Write a complete book. If it's pretty decent, rewrite and rework. If it stinks, trash it and start another one. Finally, FIND YOURSELF A CRITIQUE GROUP. Notice the annoying usage of all-caps there. A critique group will change your life. Week in and week out you can meet with a few friends who also like to write, people who understand you, people who are as weird as you, people who are as oblivious as you are to the pundits who say you can't do it. Help each other, read aloud, be honest, grow thick skin, push each other. Start searching for these whackos today. Well, I don't know what else to say. I'd love to hear from anyone else if they have advice. Please comment and help us out. Once you, New Writer, have some good material, THEN you can worry about how to get published. That day is down the road, in the future. For now, just start writing. Then write some more. I know I haven't given a lot of tangible, take-away-point-ish type of advice here. But I guess that's what you get with such a broad question. A broad answer. Feel free to follow up with more specific inquiries. Ooh, such a big word. Q&A will be a regular part of this blog. If you ever have a question, just post it in the comments, and I will save it in my file until it's your turn. Now go write!!!!!! 1000 words, tonight. No matter what. Promise me. I don't care if it's about Snuffalupagus, just do it. Sorry I've been so quiet this week. The last couple of days were a whirlwind of school visits and I haven't had much time at the old potato rigormortis, aka computer (if you're confused, see prior post). I want to give a shout out to the eight schools I visited: Centerville, Snow Horse, Vae View, Crestview, Holt, Antelope, Bluff Ridge, and Cook Elementary. I can't say enough about the school leaders, the teachers, the librarians, and, most importantly, the awesome students. You guys were great and I really enjoyed being with you. The future of our world is in good hands. Also, a big thanks to Cathy Jensen and Brent Severe from the Davis School District Foundation. You guys are doing a lot of good and I'm glad I could help out. Cathy was an excellent host and was a lot of fun to hang out with. Especially as we ate an exorbitant amount of food at Red Lobster and Olive Garden! Thanks to Deseret Book for lugging my books around, too. You guys are awesome. If any of the students I visited happens across this blog, thanks for the hospitality! And thanks for courtesy laughing at all my lame jokes. Shoot me an email. So, evidently, I'm an idiot. A couple of days ago, my editor calls me, her voice filled with excitement. Before I can say a word, she rattles off something like, "James, we got the blue lines for the ARC today and they look so awesome and as your editor I feel I must tell you about the mistakes we found but don't worry because it's nothing major and we're going to tell them to go forward if you're okay with it and . . ."
At this point, I sheepishly interjected and asked, "What are blue lines?" I was met with the silence of a sealed grave. Another silence. Then: "You don't know what blue lines are?" Me: "I have no idea what that is." Okay, it didn't go quite like that, but close. Now, I'm sure many of you know what blue lines are, unlike me, the Stupid Guy. But in case you don't, I shall educate you. Blue lines (and I have no idea where the words came from) are the bound version of whatever item is being published (in this case, my ARCs - Advance Reader Copies) that are sent to the publisher by the printer before they move forward with the full print run. In other words, the printer sent an ARC, just like it will look in the end, to my publisher for one final review before they start printing them in loads. That's what blue lines are. Is. Whatever. Lisa wasn't kind enough to tell my WHY they are called blue lines. Could any term sound more random? Okay, fine. From now on, my pants will be known as "duck platters" and my computer will be known as "potato rigormortis." Makes as much sense to me. UPDATE: Lisa explains the origin of "blue lines" in the comments. Anyway, the ARCs are in full production and should be done in a couple of weeks. Sweet! Okay, now that I am obviously running out of interesting things to talk about, I'll start doing more Question and Answer posts. I've saved up any questions I've received so far, and I will answer them one by one. If ever you have a question on which you'd like me to pontificate, please just post it in the comments at any time. I save them and will hit them in order. And now, for your viewing pleasure, especially any Star Wars fans, please go and watch this video: CLICK HERE. Be sure and watch the whole 2 minutes or you'll miss the "Cantina" part. Just thought I would give you a glimpse of the latest random dealings with the upcoming book. Yesterday I met with my editor, Lisa, about the illustrations for the inside of the book. A week or so ago, they'd asked me to put together a list of 20 scenes from the story that I thought would be really cool to see visually. I starred my favorite twelve. I have until Monday to complete my review of the galleys. Lisa gave me the latest version since they increased the font size. What stinks about doing this: every time I find a mistake, I realize that the mistake will be in the ARC. Luckily, they are few and far between, all minor. I asked Lisa if I could just rely on their proofreaders because I didn't want to read the stupid book again (any writer out there knows what I mean). She looked at me like I'd just suggested she drive a nail into her eyeball. Evidently, it's a cardinal sin for the author NOT to review the galleys. Anyway, I put this off for too long, so guess what I'll be busy doing all weekend. Finally, about the ARCs. I can't remember when I told you they'd be done and sent, but I think it was right about now. Well, it actually won't be until the end of October. It went to press a few days later than they thought, and since they upped the print run, it added 2 weeks to the timeline. If you were one of those expecting one, please don't start looking until early November. Sorry. The booklets with teaser chapters will be done on Tuesday the 16th, just in time for my 2 day visit to schools in Davis County. Can't wait to pass those out! 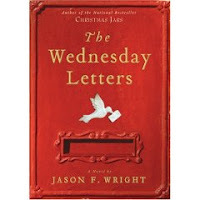 A sidenote of good news: Publisher's Weekly wrote a killer article about Shadow Mountain's latest book (THE WEDNESDAY LETTERS) and its author, Jason Wright. Since they said it, I'm assuming I can say it: His first print run of 50,000 copies (hardback) disappeared in 2 weeks and they ordered another 100,000! Plus, he's been on the NY Times list 4 weeks in a row now. Way to go, Jason!!!!!!! Now go buy it: Click here. Well, I've been "tagged" twice now, so I guess I should be a non-loser and do as I'm told. Thanks to Rachelle and Luisa for this dubious honor. I think I will use Luisa's theme, which is to tell you eight completely random things about me. I will make them as stupid as possible. 1. I have a brother (Paul) who thinks he has beautiful feet. In fact, he likes to share this with anyone who is willing to listen. I find it quite disturbing. 2. One of my favorite meals is toast, smothered in peanut butter, dipped in hot tomato soup. If you cringed at this instead of my brother's obsession with his own feet, then something is wrong with you. 3. When I was a kid, I was so obsessed with the Atlanta Braves that I kept a scrapbook. I would cut out the box score from the newspaper for every game and glue it in my book. When I lived in Japan, my wonderful mom sent me the newspaper clippings for every Braves playoff game (though I'd finally quit the scrapbook business). 4. When I was eleven, I visited my sister, Lisa, and her family at Virginia Beach for a whole month in the summer. I became friends with all the rugrats in the apartment complex, and somehow convinced them that I was a guardian angel sent to watch over them. They did anything I commanded. True story, and I am ashamed. 5. When I was four, I opened every Christmas present under the tree while all my older siblings were away at school and my mom was upstairs. In a moment of sheer genius, I put all the presents back under the tree and hid the mounds of wrapping paper behind the dryer. Somehow, my mom figured it out and rewrapped all the presents before the kids got home. The only one I remember is that my brother (who is obsessed with his pretty feet) received a Slinky. 6. When I was in Middle School, I was part of a competition called Odyssey of the Mind. We won the Georgia Championship and went to the World Finals in Arizona. We lost. Terribly. But I got a free trip to Arizona and saw the Grand Canyon. 7. I hate peas. I hate them like I hate eating sourkraut that's been rubbed on Paul's feet. I despise them. They are evil. Have a wonderful day. And seriously, go buy some Degree deoderant, Clean Shower scent. Click on them to see the bigger version. The top one is the preliminary cover they used for the ARC. They told me the artist is making a few more changes. Also, the titles will be in silvery embossed foil and there will be sparkly sumthins in those shooting lights. The bottom one is the cover for a booklet they just sent to press that will have the first 2 chapters, a letter from me, and a sample of the book's glossary. You might start seeing those in bookstores in 3 or 4 weeks. The artist's name is Bryan Beus. He has officially joined the Dashner Dude's Top Twenty Most Favored People List, bumping Abe Lincoln to Number 21. Also, major kudos go out to Richard Erickson and his incredible team at Shadow Mountain. I had such an amazingly wonderful experience yesterday, I just have to share. Butterfield Canyon Elementary in Herriman, Utah was kind enough to invite me and Anne Bowen, a picture book author, to speak at their school. Angie Wager from Barnes and Noble (mentioned previously in my drawn out back story) was the force behind it. Ya know, I've done a lot of school visits, but I never, never get tired of it. In the afternoon, I spoke to the 5th and 6th graders together, then the 3rd and 4th graders together. In the evening, as part of their "Literacy Night", we had a booksigning. This is what blew me away, especially considering my recent post on Obert Skye and his Line of Infinity. I met kid after kid, and their parents, for over 2 hours, signing far more books than I've ever sold at a signing. But I just have to rave about these kids, and their awesome teachers, and their awesome Literacy Facilitator, Laurie Larsen, and their super duper califrigilistic Principal, Shelly Davis. I was just so impressed and thoroughly enjoyed every minute. Thanks to everyone at the school, and to Angie, for an unforgettable day. And a huge Shout Out to all the kids I was so fortunate to meet. Especially to the ones I had so much fun embarrassing in front of their classmates. Ya know, I am so thankful I get to write for the young folks. I feel so sorry for people who write for boring old adults. Bleh. There is just something magical about seeing that sparkle in a kid's eyes as they step up to meet you, holding a book in their small hands, staring at you like a hero. Good gravy davy in the navy that sounds cheesy but I don't know how else to say it. To know that you've somehow inspired a kid to read, or to write a story, or to follow their own dreams - there's nothing like it in the world. Nothing! I can't imagine anything being more fulfilling, more rewarding. I'm the luckiest schmoe who was ever born. And I can't wait to do this for the rest of my life. Butterfield Canyon Elementary, you ROCK!!!!!!!! So I got my contract, turned in the book, breathed a sigh of relief when everyone said they liked the finished draft. Like I said before, I kinda skipped here all the wonderful people who looked over my book BEFORE I turned it in, but that would really be boring except to those who did me the favor. You'll get your slap on the back when you see the eagerly-anticipated Acknowledgements section (in which Peter Jackson and chickens are also mentioned). And so began the editing process with my talented, brilliant, lovely, stupendous, invigorating (is that enough, Lisa?) editor, Lisa Mangum. Imagine my surprise when she gave me 7 single-spaced pages of notes for suggested changes. At first I wanted to throw up but then felt much better when I realized none of it was TOO major. My plot and characters as a whole were safe. Then Chris (Product Director) read it, Round Four. Rewrote. Then the kid focus group, Round Five. Rewrote. Then "The Board", whoever the heck that is, Round Six. Rewrote. Somewhere in there, I think Lisa gave me some more ideas, because I seem to remember seven rounds. But all in all, it was fun. They (collectively, but most kudos to Lisa) improved the book dramatically. What I had considered a pretty decent story had become a really publishable, ready-to-be-devoured novel. This is the hope, in any case. Somewhere in all this, the name of the main character (Mason McGee) was changed to Atticus Higginbottom. Atticus was actually the name of my character in a book I wrote called THE WORLD SIFTER, which is sitting on my computer, waiting for its day in the sun. Chris wanted a more unusual, catchy name, so I cannabilized my own story. It really took awhile to reconcile that in my mind. Mason had become a part of me, and suddenly he was Atticus. It was doubly confusing because Atticus was a completely different character in my mind as well. But it was a good change and my brain finally accepted it. 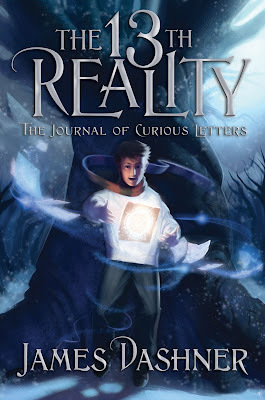 Also, originally the story was called THE NINETEENTH REALITY. When Chris gave his pitch to "The Committee", whoever the heck that is, he accidentally called it THE THIRTEENTH REALITY, and everyone liked it so much it stuck. That made for a little adjusting in my plans, but not much. It's only a number. Somewhere later, the number was used instead of the word, and now it is offically THE 13TH REALITY. I think I've brought you up to speed. I'm now working on the sequel, which is tentatively called THE PLAGUE OF DARK INFINITY. Shadow Mountain had me map out the series as five books, so that's where it stands now. But each book will stand alone much more than my Jimmy Fincher series, which was really one big book sliced and diced into four. 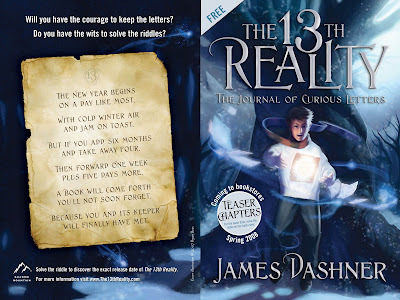 But, of course, there is a huge arc that goes over the whole series of THE 13TH REALITY. Whew. Breathe in, breathe out. And so, here I am, anxiously awaiting the month of March. I have no idea what to expect. This is a brutal industry. An unpredictable industry. If there were a magical formula for bestsellers, then every book that came out would be one. But there isn't. Despite all the work, all the editing and rewriting, despite all the planned marketing, you just never know. In the end, only one thing will matter. You, Reader, and your opinion.